Emma Bolland is an artist, writer, and musician based in Leeds. After several years as a musician she returned to her art and writing practice in 2004. Both her visual and written work has dealt largely with narratives of danger and sexual risk filtered through the lens of site, memory, and post-traumatic landscapes. She uses a range of media including drawing, film, text, performance and sound. 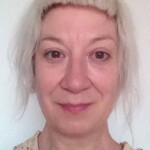 She is currently collaborating with curator Judit Bodor and artist Tom Rodgers on ‘MilkyWayYouWillHearMeCall’, http://youwillhearmecall.wordpress.com/ looking at fictional narratives of The Yorkshire Ripper in relation to actual sites. The physical book is a haptic seduction, a visual delight. In its material presence, its ability to be physically held, it offers a fragile promise of both literal and psychic binding; bounding and securing a narrative of creative ownership. Being seen as, and seeing oneself as ‘author’, is entwined with the state and status of ‘being published’, and the complex relations with a perceived parental authority of a real or imagined editor / curator, and with a desire to direct and control the readings of one’s texts and images. A psychic ‘dust jacket’ might protect the artist’s / author’s practice from pollutions that could undermine the sense of a defined and protected creative self; a literal ‘body of work’. The idea of ‘book’ could therefore be seen as a hybrid Freudian / Lacanian fetish, in that it conceals an intangible and un-writable absence, the elusive self. The presenter’s current collaborative project, ‘MilkyWayYouWillHearMeCall’, had initially intended its outcome to be a text / image publication. The project revolves around both real and fictional narratives of the ruptured body; the body shredded, dismembered and scattered. As the project has developed, the material being produced has become increasingly unruly, resisting both the narrative and physical bindings that might reassure the collaborators regarding both the object and subject of the work. We must now question the physical seduction of the ordered page, and ask ourselves whether we are able to imagine an alternative to the ‘dust (strait) jacket’ of binding that is the unruly and mutable possibility of the ‘creative codex’, which will open itself to a capricious restructuring by those to whom it is handed over.